Two weeks ago a light and small package from fitnessfootwear.com landed on my doorstep. 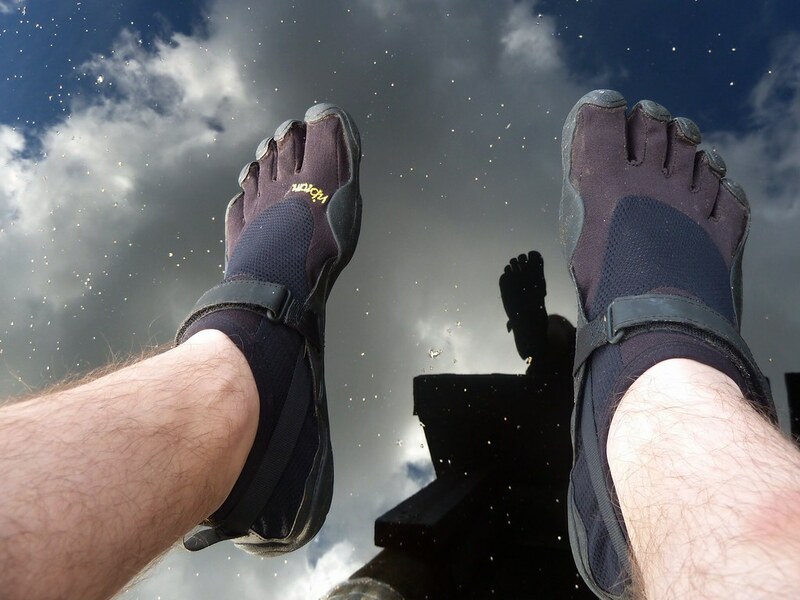 In it I found a pair of Vibram Five Fingers KSO in Ninja Black (what else?! ), Size 41, weight 300 grams for the pair. Since then a new relationship has started, and wearing any other shoes is something I don't look forward to. Chillin at the lake. And yes, you can swim in them! 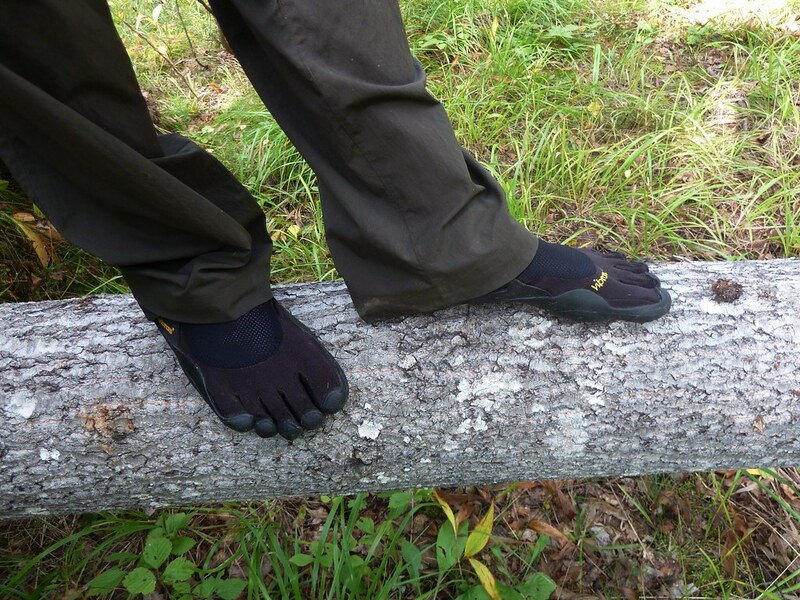 The first time I read about Vibram Five Fingers "shoes" was on the Red Yeti's blog, and earlier this year LAUFBURSCHE and Ultra Knilch went for a hike and run with them. All of them were of the highest words about them, and so I decided to get a pair. I was thinking a bit about which VFFs to get - the Bikilas looked tempting, but as they weren't yet available I went for the KSOs. The strap around the top of the foot for some extra support is useful, and the abrasion-resistant stretch nylon/ mesh upper is warm when wet wet yet airy, so no overheating. The problem with the mesh is that it lets a bit of tiny sand through, and worse, allows mosquitos to bite you. ... thanks to the super grippy Vibram sole. So, how is it walking "barefoot"? I love it. As I said above, after wearing my VFFs it is difficult to put other shoes on. My gait in the VFFs is more natural, I love the "massaging" effect of them - no worries, you're not getting hurt when walking over sharp stones, gravel, glass or similar sharp objects which usally would feel painful when walking barefoot. My partner tried them on last Sunday, and came home with a smile on her face and told me that it was the first time she felt she'd like to go for a run, and decided to get a pair herself! 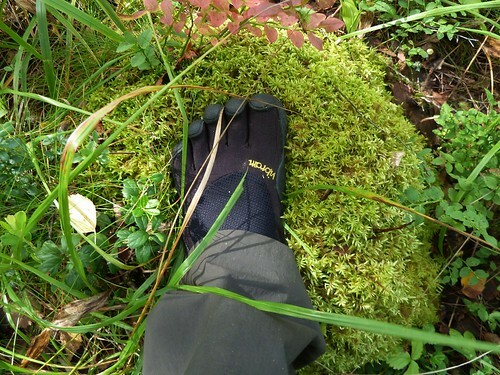 Feels so soft and great, walking on moss! 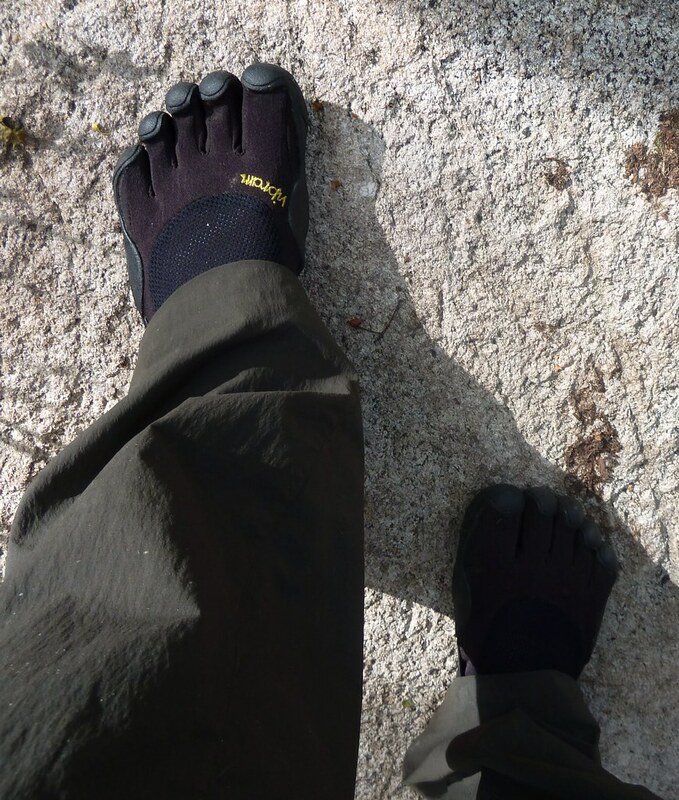 During the IWG Forest week I wore the VFF KSOs for the first time, a whole day straight, including offtrail navigating through dense forests, bogs, clearings, up and down hills with small climbing passages, and never did I feel scared to hurt myself, twist my ankle or similar. 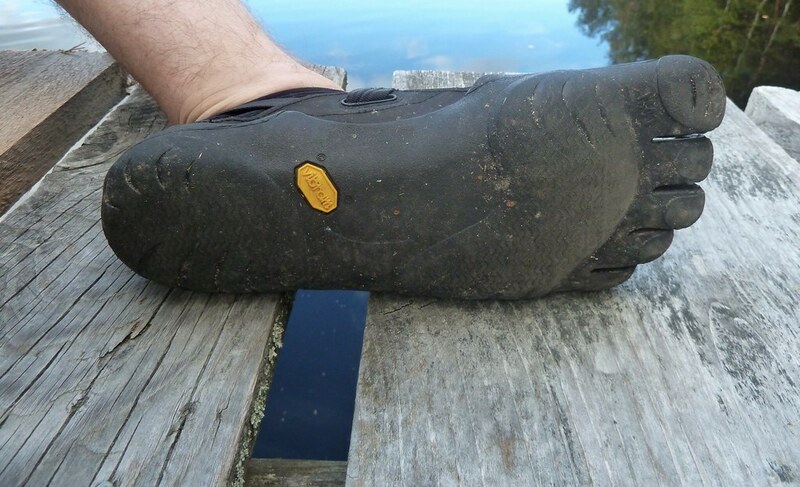 The perfect sole protects your foot so well that I didn't even bother looking where I walked. Last week I was wearing them when we went to search mushrooms, and this week - BCU Canoe and Kayak week - I will wear them every day as they're perfect for that. Even hiking with a good 10 kg on my back they were perfect, I didn't worry I might injure myself - which I think is the biggest worry people might have. That worry comes from the brainwashing Meindl, HanWag & Co. are sending out (of needing boots to protect your ankles, etc.) and after decades of brainwashing the idea that hiking = hiking boots is firmly in the minds of the majority of hikers. But with the VFFs your feet are moving the way evolution intended them to, your five toes give the best grip - better than any sole ever will (that includes, I am afraid, the Inov-8 Roclite sole). Your gait is natural and you strike ball first, instead of heel first - the latter sends a shockwave through your joints and spine and is very unhealthy. Well, what is the conclusion? I will continue to use my Inov-8s, yes, but my number one go to footwear till the snow is here will be my VFF KSOs. They feel just to comfortable, natural, healthy, relaxing and good to miss an opportunity to use them. On the coming Russia expedition we apparently are "required" to take Wellies to cross bogs and rivers - I will take my KSOs at a fraction of the weight and triple the comfort. After all, wet feet should be embraced instead of feared. 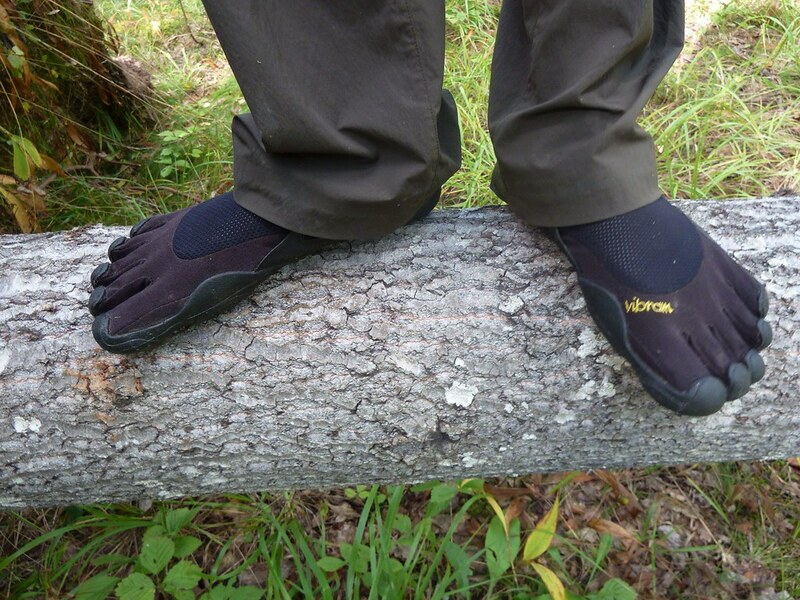 In my opinion they are perfect for the lightweight and UL backpacker, as with our small loads and our open minds we are ready to take the next step of going barefoot! Finally, I'll follow this first look up with a long-time review after I walked few more hikes and trips with them, but so far I haven't been that excited to put my shoes on since I learned to tie my laces!